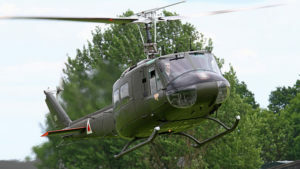 The 2004 documentary In The Shadow Of The Blade follows the journey of a restored Vietnam War UH-1H Huey across the United States to document the stories of Vietnam veterans and their families. These stories provide an extraordinary opportunity for understanding and healing, which for decades, alluded those who served in Vietnam. 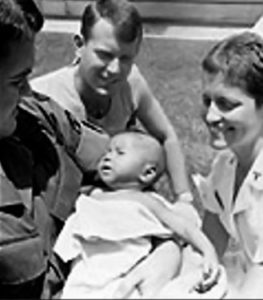 Among the stories told in the film, one stands out as a lesson in hope, persistence, and “doing the right thing.” It’s the story of “Baby Kathleen,” the South Vietnamese infant who survived against all odds. Without the servicemen who found her in the arms of her dead mother, the helicopter pilot, and servicemen who flew her to a field hospital, and without the doctors and nurses who tended her wounds, Baby Kathleen would be yet another civilian casualty of the Vietnam War. Georgia’s own Donna Rowe tells the story of “Baby Kathleen” in the documentary. Donna served as the triage nurse captain at the 3rd Field Hospital in Saigon during 1968-69. One day, a helicopter radioed they had a severely wounded infant on board. As there were other hospitals in Saigon and the triage room was overflowing with wounded, Vietnamese civilians were last on the triage list. Despite protocol, Donna made a decision to take in the wounded baby girl. Not sure the infant would survive, she buttonholed a Catholic priest on the way to surgery, demanding he baptize the baby. Making do with water from a spigot, and with Donna, and the two men on the gurney’s sides as witnesses and God-parents, the priest baptized the girl, Kathleen Fields. Donna chose the name Kathleen from a song her father used to sing to her, and Fields for the name of the 3rd Field Hospital. Baby Kathleen survived her wounds and stayed at the 3rd Field Hospital – again against the rules – until an American soldier wanting to adopt Kathleen cut through the red tape and bureaucracy to do so. “Kathleen” made her way to the United States to live with her adopted family. 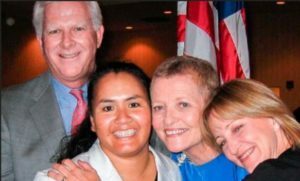 Thirty-three years later, Donna told “Kathleen’s” story to a reporter whose article led to finding “Kathleen” in California, Donna met “Kathleen,” her adoptive parents, and her children. They remain friends today. Sid grew up in rural Missouri, and like many “farm boys” of the era, he enlisted in the Marine Corps at age 18 after receiving his draft card. 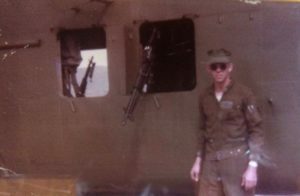 He served in the Marine Corps for four years, the last of which was in Vietnam as a helicopter gunner stationed in Phu Bai, just south of the DMZ. After returning from Vietnam, he made his way to Georgia and joined the Georgia Air National Guard serving another 30 years! Sid is a humble and thoughtful man, and his war experiences affected him deeply, staying with him through the decades. Like other Vietnam veterans, he felt a subconscious anger and shame that permeated his soul. And like others, he didn’t talk about it. 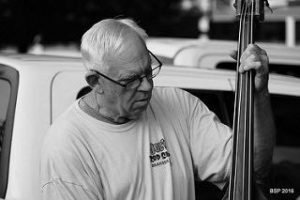 By the 1980s, Sid had what can only be described as a passion for songwriting, all kinds, but particularly country western and then bluegrass. The “three-chord poet” carried a notebook and a cassette recorder with him everywhere, even pulling off the highway to record his thoughts. During this time, the Vietnam songs kept “bugging” him – they had to be written. Although they began as a personal cathartic experience, they evolved into a story Sid wanted to tell. The lyrics describe the action but convey so much more. Fighting in Vietnam, the warrior faced death or worse. The Missing In Action (MIA) just disappeared. For their families, the war never ended. In the “MIA Song: I’ll Be Right Back,” a recon patrol clears a place to dig in – one man goes out to set the perimeter and never returns. They never sent his helmet home. Never sent his belt and pack. Sid didn’t plan to make a CD, he just wanted to record demos of a few of his songs. He worked with local studios, singing and playing guitar to a piano accompaniment. After spending hours and hours on the time-consuming task of recording and editing tracks on reel-to-reel recording systems, they just didn’t sound good. Sid burned out on his songs – but he never quit writing, and wouldn’t or couldn’t let go of his Vietnam ballads. From the mid-1990’s to 2010 recording had to take a back seat. As part of the Air National Guard, Sid “commuted” between Atlanta, GA area to Warner Robins Air Force Base in middle Georgia from 1994 to 1999. At the same time, he was taking education courses, eventually acquiring his teaching credentials. After retiring from the Georgia Air National Guard in 1999, he taught high school until he retired from education in 2010. For the first time in over fifteen years, he had the time to devote to his songwriting, and to the Vietnam ballads that wouldn’t let him go – the time had come. Remembering his previous recording experience, Sid decided to go to Nashville, the “Home of Country Music,” with professional studio musicians and vocalists. He met Galen Breen at Gator Hole Studios, and the two discussed the ballads and how Sid wanted to convey his message. Sid returned home and prepared two songs a week for Galen to record. With Nashville studio musicians and the talent of 70’s country western singer, David Wills, the songs came to life in the 2013 CD release – Vietnam: The Journey. After the CD’s release, Sid found it rewarding to receive positive feedback from friends, family, and fellow veterans who were “blown away,” or “in awe.” One veteran said he couldn’t stop listening to it – the songs touched him in ways he could not describe. Have a question or a comment? Please send us a message.